Eventually, Darren left and it was just Lea for awhile. She sang a couple songs off her first album like “Cannonball” which I really love! Like she did with Darren, Lea spoke in between the songs, sharing stories or little tidbits. While she was singing “Battlefield”, she sang the line “We seemed like a good idea” and then said, not singing, “We weren’t a good idea.” She had mentioned before the song that it was about an ex-boyfriend. I just thought it was kind of a cute little aside in the middle of the song. 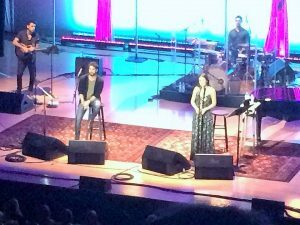 Darren came back on the stage and Lea and him sang her song “Getaway Car” from her second album. It was fun hearing them sing one of Lea’s songs together and I thought they sounded wonderful! After this song, Lea left the stage and it was Darren’s turn to go solo. He started with a cover of “Cough Syrup” by Young the Giant, which he had sung on Glee, and I love this song/Darren’s version. 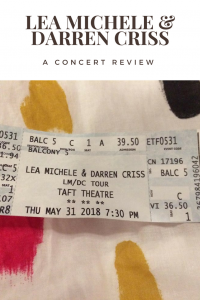 While I’d seen Lea perform during one of the Glee tours, I’ve actually seen Darren in concert on his own, so it was great kind of getting that opportunity again. Like Lea, Darren talked in between singing various songs, both his own and cover songs. He mentioned that his set changes a bit for every show and that he wanted to sing a song for every city that was performed by someone from that city. For Cincinnati, he mentioned a few possibilities like The National and Walk the Moon, but he ultimately decided on “Hey Leonardo (She Likes Me for Me)” by Blessid Union of Souls. This was a really fun cover! I definitely recorded more of Darren’s performances than Lea. I didn’t mean to, because I didn’t plan on recording more than one or so songs per person, but Darren kept singing songs that I love and/or really wanted to share with a friend of mine who is also a big Darren fan. Granted, I never recorded an entire song, as I like to actually watch the performance and not just behind the screen of a phone. One of the songs that I recorded some of was “Not Alone” which is a song that Darren wrote and even used in A Very Potter Musical (if you don’t know, Darren has a group of friends who met in college and created A Very Potter Musical – Darren was Harry Potter- and other musicals under the name Starkid). I’ve actually seen Starkid live twice – minus Darren – so it’s always fun hearing these songs. He also sang his version of “Teenage Dream” by Katy Perry, which he did on Glee and is a popular cover song for the show. He mentioned before he started playing that he knows people like to sing along to this, but he would like to sing most of it (maybe 80% of it) by himself…and then started playing the song on the piano, revealing the song he meant. It’s a mostly slowed down version so it was nice to hear just him sing it! When Lea came back on stage, the two of them once again “sang” together, and by that, I mean Darren played piano (he played piano and guitar a lot throughout the show) and Lea sang “The Coolest Girl in the World” which Darren also wrote for A Very Potter Musical. It’s a song that Hermione sings, and Darren thought it fit the character of Rachel Berry from Glee too, so he’s always wanted Lea to sing it. She did a great job – of course – and I loved hearing her sing a song from A Very Potter Musical. Once the show ended, Lea and Darren came back for a one-song encore. It was an acoustic version, with Darren on guitar and both of them singing. It was a really nice, relaxed way to end the show. 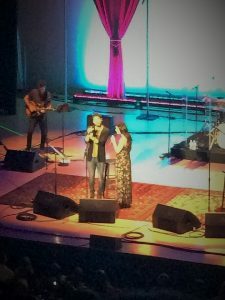 Both Lea and Darren are amazing singers – and they do a great job live – so I highly recommend seeing them in concert if you get the chance. Want to see videos from the show? I shared them all in one post on Instagram, so go here to view them! Wow, you’re so lucky! This sounds like such a lot of fun., they both have such great voices and chemistry with each other. I bet I would have liked their rendition of Suddenly Seymour. This sounds like a great show. I’m not familiar with either of them so I’ll have to check them out. What a cool show. I had no idea they were performing together. This sounds like a great concert. I actually just noticed that they are going to be coming to St. Louis. I admit that I had to ask my daughter who Darren was on Glee since he looks different with the beard. Glad you had a nice time. No way! This sounds like it was SUCH fun — I adore both these guys as singers and Glee was such a blast!! Sounds like a great show. Glad you had fun. Glad you enjoyed the show and what a nice review you have written. Hope many people take the opportunity to go and see. They sang Suddenly Seymour?! That sounds like it would be fun to check out! Oh I wish they would come here! This sounds like an amazing concert duo! Wow, this sounds like such a fun concert! I loved Glee. I think it’s so fun that Darren sang “Hey Leonardo” – I haven’t heard that song in years!! I bet it would be fun to just see the two of them interact on stage together. So cool! I’ve only seen the first season of Glee and that was ages ago! I had no idea the actors were still doing tours. I knew Darren Criss had the Harry Potter thing–I’ve seen clips on YouTube. Oh I do love Darren !! Glad you had a fab time, it sounds awesome! Oh this would be great to see! I love Lea and Darren! They have great voices! I miss Glee! Thanks for sharing this! Kim Carberry recently posted: The first of the lasts: Sports Day. I love acoustic versions of songs, a nice way to end. I love lea michelle! This would be a blast! Sounds like a fun concert!! I love when artists talk in between and give little tidbits of info. They are both so talented! I watched Glee for so long, and I would love to see them in concert! This was a pretty cool review, I’m curious now and I’ll check them out. Never heard their music before. How cool! I love them. Thanks for sharing your experience. This isn’t a concert I would’ve considered, but it sounds like it was a lot of fun. I mean, c’mon, they sang ‘Suddenly Seymour’! <3 lol. I haven’t been to a concert in so long. I also didn’t realize this was the guy from A Very Potter Musical until you said it! Sounds like it was a good concert though 🙂 I’m glad you had fun! Sounds awesome! I love it when performers give little asides or talk to the audience in between songs or whatever. And changing his set list to include songs tailored for each city is cool! Oh, how fun! I would love to see these two in concert! !